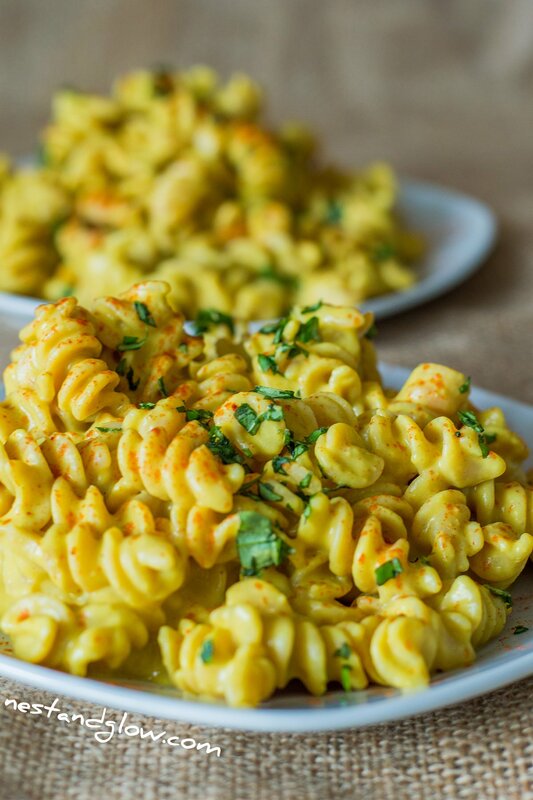 This healthy cheesy protein pasta is vegan and gluten free. One serving contains 41 grams of protein, and this recipe serves two. It’s also high in calcium from the sesame seeds and beans. As nutritional yeast contains all nine essential ammo acids, it provides complete plant protein. 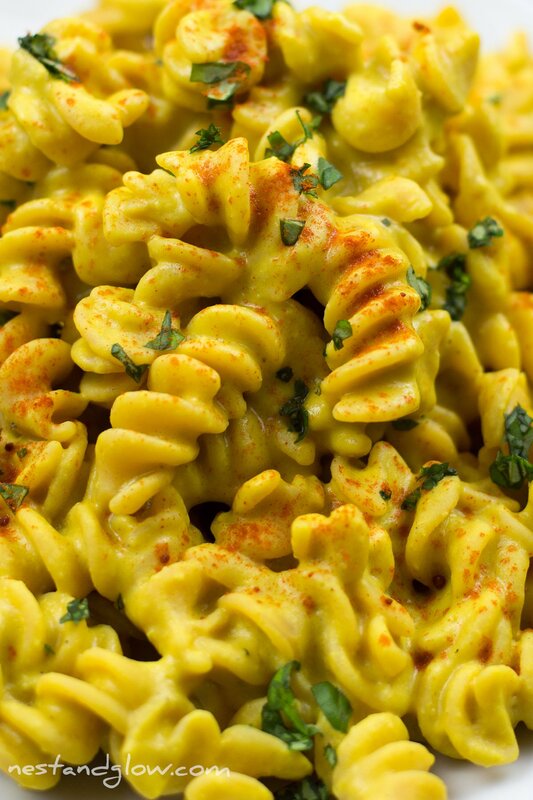 The creamy, velvety cheese sauce is also nut free, oil free and grain free. 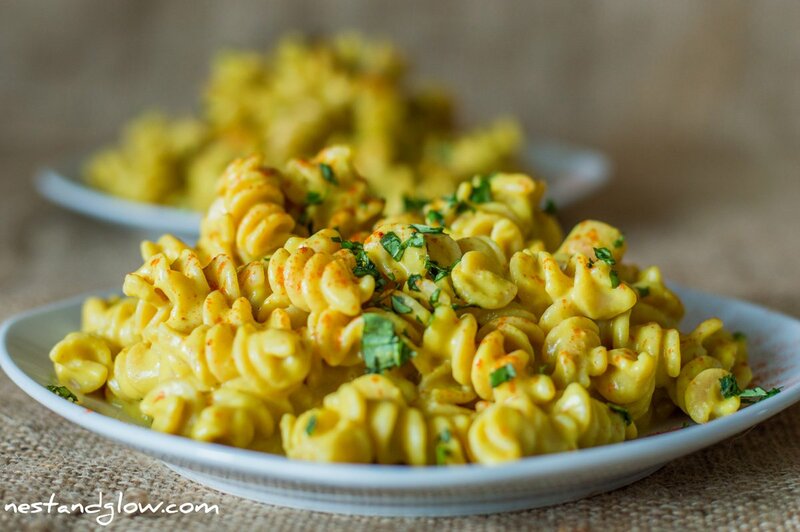 Try this quick and easy vegan cheesy protein pasta today. 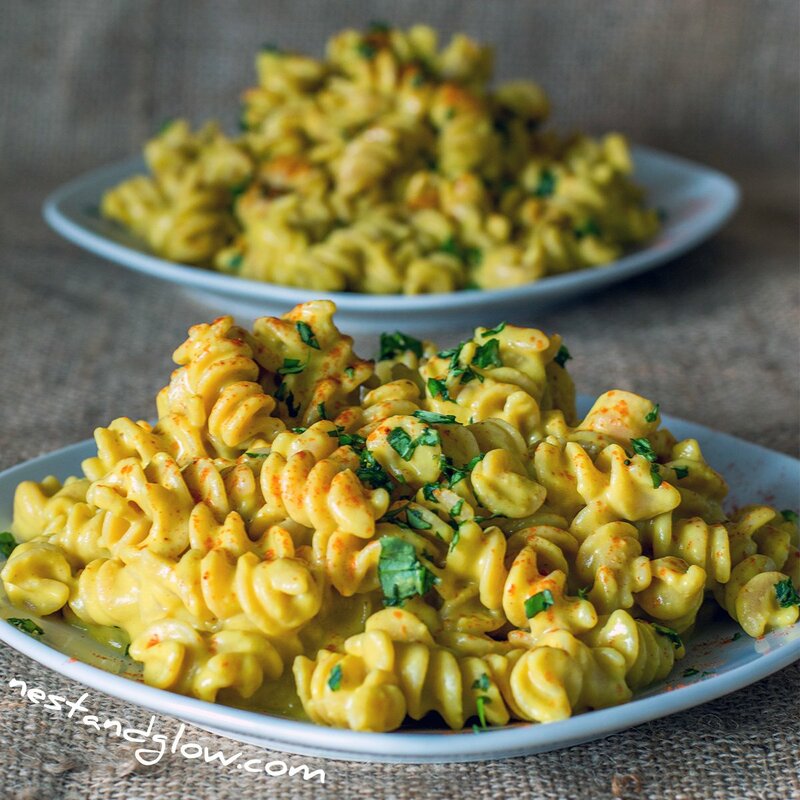 I’m using red lentil fusilli in this recipe. This lentil pasta cooks in about 9 minutes and is firm after cooking, unlike many gluten-free pastas. It’s Made from 100% red lentil flour. Bean and lentil pasta were only available at health food shops up until recently, but now they are quite inexpensive and available from regular stores. In the UK the pasta works out at 35p a portion! It’s easy to cook and tastes very similar to traditional wheat pasta. Here I use sesame seeds in this recipe rather than any plant milk. You can use your favourite plant milk and omit the water if you prefer. When you’re using whole sesame seeds, always place them closest to the blade so that they get completely broken up and combined. Turmeric helps to give a golden colour and add nutrition to this recipe. You don’t taste it but feel free to leave it out if you prefer. A pinch a black pepper helps activate the turmeric and make it more digestible. You can use regular gluten-free pasta if you prefer but for this recipe to have a high protein content do you need to use bean or lentil pasta. Normal gluten-free pasta is often a mixture of potato, corn and rice flour. While it’s gluten free, it’s full of refined carbohydrates and some stabilisers, so it’s not something that I consider healthy and nutrient dense. Use any white bean that you prefer for this I often use cannellini/ haricot/navy or white kidney beans. Either freshly cooked or tinned work just as well but I tend to use tinned is this is a quick and straightforward recipe. Other bean/lentil pasta that I can recommend are mung bean, black bean, chickpea and green lentil. Let me know in the comments below or on social media @nestandglow if you have tried any other bean or lentil pasta. View cheesy protein gluten and dairy free pasta video recipe. Drain the beans and place everything apart from the pasta into a blender and whizz until combined. Cook the pasta as per instructions and drain. Stir in the cheesy bean pasta sauce. Serve with smoked paprika and basil sprinkled on top. Store leftovers in the fridge and enjoy within three days. If you want this to be gluten free but also healthy and can’t find bean pasta then I recommend buckwheat pasta. This pasta is easy to cook, but you do need to keep an eye on it and rinse it under cold water as soon as it’s cooked to stop it falling to pieces and becoming one doughy blob. If using canned beans do you use the entire can with the aqua fiber or do you drain? Sorry about that, should definitely be fixed now – it was saved as a draft rather than published. Made this tonight. It certainly wasn’t bad, but it wasn’t great either. Probably wouldn’t make it again. Hi Dale, sorry to hear that 🙁 any feedback on the taste as what it was lacking or what exactly wasn’t good with it? This looks amazing! I am on the candida diet so can’t really eat beans, any suggestions for a substitute (I know it would be lower protein) or are they integral to the recipe? This dish was way too bland for me. Next time I will add mushrooms and onions and tomatoes. Do you think I could substitute the sesame seeds with something else? Oh no sorry to hear that, can you elaborate on why was it so bad? The sauce is absolutely delicious! My husband who swears that he does not want to eat anything except real cheese asked for this sauce instead of cheese. The only thing I did different is I omitted the water & sesame seeds and added a 1/2 cup of almond milk. Would 1 TBSP tahini work in place of the sesame seeds? Yep it sure would, I’m just using the whole sesame seeds as they are easier to source and you can soak them. Made this tonight, I used 1 table spoon of tahini instead as I didn’t have sesame seeds. It was gorgeous! Absolutely loved it. The nicesest cheesy pasta ever. My 9 year old son who is a very fussy eater had two bowls! Thank you. Can I use pinto beans for this recipe? Yes that would work, the colour will be a bit off but it will still taste great. I’m not sure why but pinto beans are probably my fave! Made this for dinner tonight and thought it was delicious! I used butter beans and added shiitake mushrooms and spinach. Definitely will be making again and trying different veggies. Thanks for sharing! Pretty savory! I added an extra tablespoon of nutritional yeast and 1/2 teaspoon of salt and then heated it on the stove before adding the pasta. It was a good, unique and really easy recipe! I can see how it might not be for everyone but its definitely not terrible! It was delicious and easy to make. Thanks for sharing. What would be a good substitute for sesame seeds in this recipe? I ran a tablespoon short but still tasted great. Made mine today, very good however maybe too dry? Am I the only person with this issue?!???? I make this all the time!! It is one of my favourite recipes and always comes out amazing!! So quick and easy too! Thank you! I made tonight and – even though I am not a fan of nutrition yeast – I did enjoy it. I used tahini and almond milk and I added onion powder, miso paste and topped with vegan Parmesan. I reserved and used some of the pasta water based on the “dry” posts. Fast and easy. I will make again! Thank’s that’s great to hear!